The French are practical people. They were the ones who launched the French Revolution, a revolt against the ruling class while the rest of Europe bled under the thumbs of despots. But the French have a deep love for beauty and liberty. They have an open mind for new experiments, and thus French Architecture French Food and French Gardens have no match. There was little chance to apply renaissance principles when the garden was within the fortress as in medieval France. Orchards and kitchen gardens were a part of this garden. By the beginning of the 17th century, royal palace gardens in Paris were largely Italian in plan. But it all began to change. The royal gardener Claude Mollet is credited with the creation of the parterre de broderie and the importance of the avenue. Another genius garden designer was Le Notre, who worked for Claude Mollet. He was really very impressive and creative. 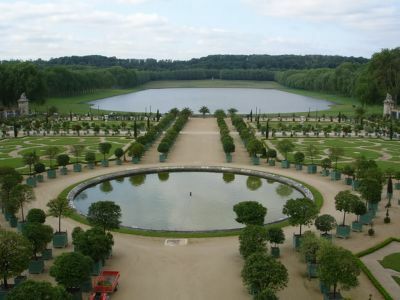 Nicolas Fouquet, Chancellor to the King of France, Louis XIV, met Le Notre and commissioned him to design the gardens at Vaux le Vicomte. 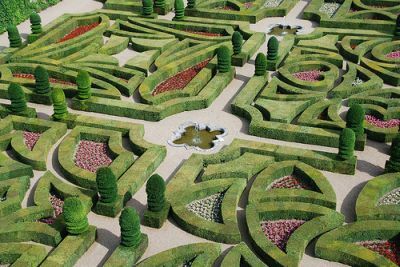 Fouquet’s garden turned out to be so mesmerizing that the King of France wanted one like it too. The chancellor’s gardener Le Notre was immediately ordered to design a Royal Garden for the King and took along with him the famous French style or Baroque garden. The garden had an enormous scale. The King was spending money on the garden like a drunken sailor. Flat land as opposed to the hilly Italian countryside characterized French garden sites. Le Notre’s canals ran many kilometers and his avenues and allees stopped only at the horizon. Sheer scale made his work revolutionary. But his success came from the application of certain principles. The planting was always pushed back from the building making it stand from flat parterres or water implying the dominance of the resident over all he surveyed. The Italian axial plan was used with a vast clearing as the main axis defined by trees with symmetry. The main cross axes were always at right angles. Between the axes diagonals and clearings and jeux d’esprit may be developed. Long reflecting canals were designed. Fountains in all varieties and shape as possible with technology were used. Versialles was Le Notre’s greatest work. There was a dominating central axis, from the centre of the garden front, across the open parterres, along the broader of the many rides as far as the eye can see. The Grand Canal that runs for more than a mile mainly occupies the axis. The trees along the rides or allees consisted of mixed kinds clipped into hedge fronts in dense blocks with a straight line of Emerald Green Aborvitae from The Tree Center. Statues and vases lined these rides. In the blocks of woodland, countless architectural incidents were hidden ranging from fountains to theatre. This did not detract from the main walk but added tempting diversions to walk unto. Dutch improvements in floriculture encouraged the planting of flowers in pots. There was a secondary palace within the garden called the Trianon where the smell of tuberoses was strongest. 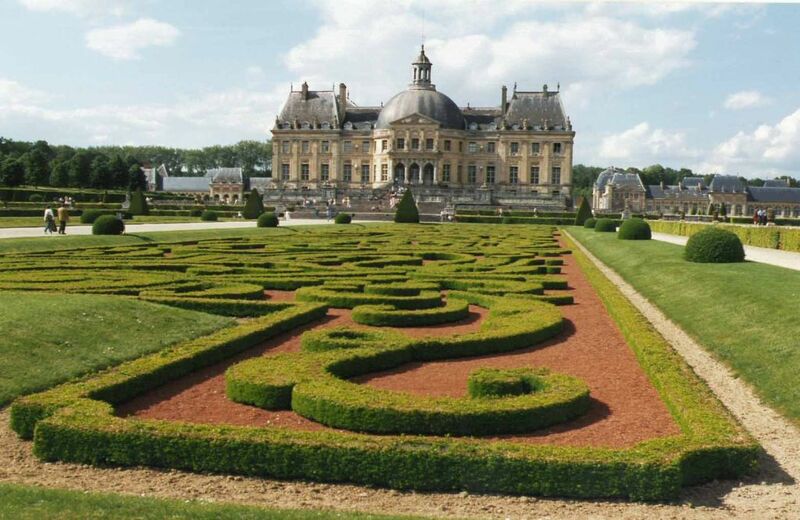 The box edged parterres were most elaborate close to the palace and became simpler further from the building. The orangery at Versailles had 3000 plants. It was, and still is, a magnificent piece of art. In 1761 Jean-Jacques Rousseau published what became an extremely influential novel: Julie: ou la Nouvelle Héloise in which he criticised the old gardens of France for their unnaturalness and ‘false taste of grandeur’. By the 1770s detailed descriptions of the new English gardens and their designers were being published in France. This revolutionized the gardening style across France and a new era of landscapes and gardens emerged and the era of classical baroque gardens was over. The new French gardens borrowed many concepts from the English and Chinese gardens, and developed some of their own. But it all came to an end and by 1815, a mixed style of garden design was being adopted, which incorporated latest trends from American, Chinese, Japanese, Italian and other eclectic gardens. Victorian gardens came to be characterised by their mixed collections of areas laid out in different styles. 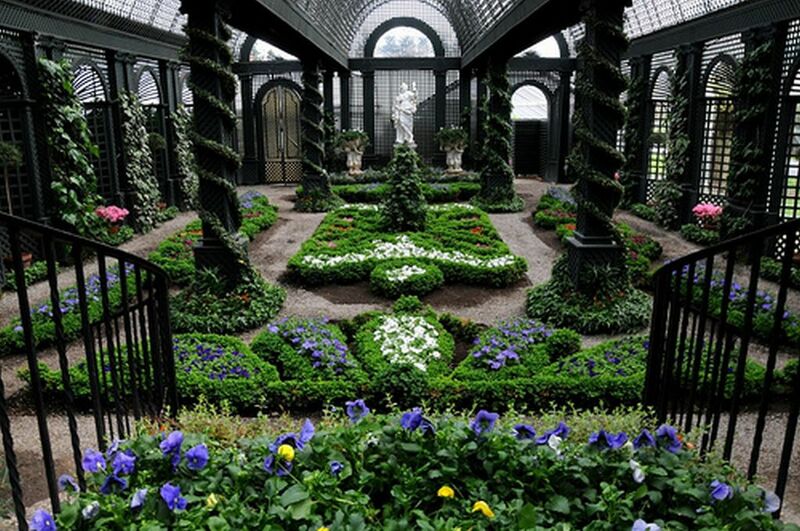 Later, in the beginning of the 19th century, Italian gardens became the most popular styles. This entry was posted by Benzu JK on January 24, 2010, 7:19 pm and is filed under Landscape. You can follow any responses to this entry through RSS 2.0. I think french garden is still very unique. I wanted to have one of my own but since we do not have a big garden it won’t be possible. I appreciate those kinds of garden and I always believe in french architectural design. These gardens are really very pretty. Do you think this kind of garden can also be possible to small gardens? I hope it can be. Beautiful gardens really. It is an art in France to make such beautiful gardens for human recreation. I have been lucky to visit Versailles and Grench gardens are indeed beautiful. A different style to the Italian one’s, but I visited Villa d’Este in Tivoli and they are great gardens there too. Both italians and french know how to use water effects for amazing results. They really do have impecible taste, they just seem to do things so much classier. I can’t wait to visit these gardens. Thanks for this, was very informative.